Dhaka, 11 April, Abnews: After a couple of rescheduling, Bangladesh’s first commercial satellite Bangabandhu-1 will be flying to space on May 4. Bangabandhu-1 project director Md Mesbahuzzaman confirmed the new schedule to UNB over phone on Wednesday. “US company SpaceX who will put Bangabandhu-1 into orbit has sent us a letter confirming the new schedule,” he said. The launching schedule of the country’s lone satellite has earlier been deferred several times. The Bangabandhu Satellite with a capacity of 1,600 megahertz will have 40 transponders and the physical equipment of the space capsule that measures the capacity. Half of the capacity will be reserved for the country while the rest will be rented out, said sources at the satellite project. On October 21, 2015, The Cabinet Purchase Committee approved the project to buy the satellite system. Later, BTRC signed a deal involving Tk 2,000 crore with Thales Alenia Space to construct the first-ever satellite project. On September 9, 2016, an agreement of 157 million Euro (equivalent to Tk 1,400 crore) with Hong Kong and Shanghai Banking Corporation (HSBC) was signed for financing the project. 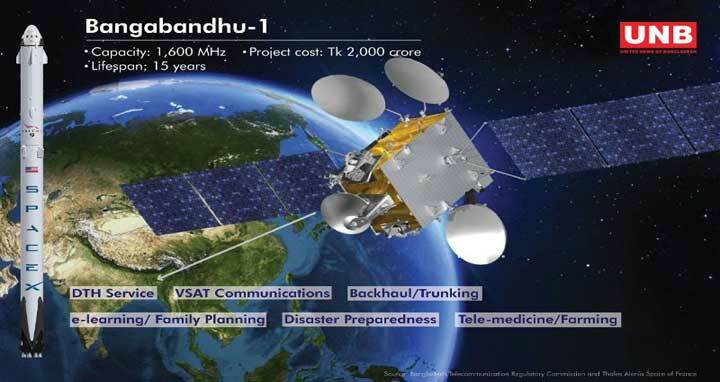 Bangladesh is currently meeting its satellite connectivity demand through renting a bandwidth from foreign operators and the country has to pay Tk 14 million US dollars a year for it.